Ever wanted to create and explore a world controlled by your mind? Now you can, thanks to the integration of immersive virtual reality and brain-computer interfaces! 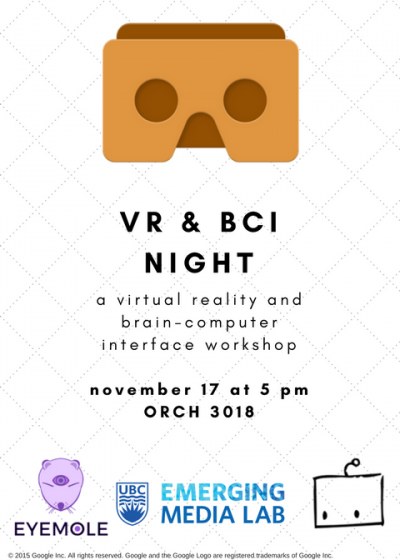 Come out to the virtual reality and BCI workshop on November 17th and follow along as the Emerging Media Lab’s Eyemole team teaches us how to create a simple virtual reality app with gaze input as well as EEG input. In this workshop, you will learn how to use Unity and get to explore your creations using Google Cardboard and a Muse headband. In collaboration with the Cognitive Systems Society.